My hair care products consist of the Pura D'or anti-hair loss shampoo (gold label), Pura D'or conditioner, as well as Pura D'or argan oil. All products are made of mostly organic ingredients, and are gentle on hair. The shampoo works by blocking DHT (dihydrotestosterone) and promoting hair growth. I've seen success with the products and my hair is very long and doesn't fall out the way it use to. My hair care products consist of the Pura D’or anti-hair loss shampoo (gold label), Pura D’or conditioner, as well as Pura D’or argan oil. All products are made of mostly organic ingredients, and are gentle on hair. The shampoo works by blocking DHT (dihydrotestosterone) and promoting hair growth. I’ve seen success with the products and my hair is very long and doesn’t fall out the way it use to. Hi everyone! I thought I’d share with you a bit about my hair. So, this is primarily going to be a review of the products I use which are from Pura D’or. I use their anti-hair loss shampoo, with the gold label, their conditioner, as well as their argan oil. All three products are organic and much of the ingredients are organic. You will not find anything that will damage your hair. I’ve been using these products for some time with pretty good results. They are quite pricy. The shampoo will cost you around $40 to $50. Conditioner at around $30. And 4 fl. oz. of argan oil at roughly $50. The reason why they are so expensive is because they are mostly organic, and because there is no such thing as cheap argan oil. Be prepared to spend around $10 per fl. oz. of the oil. If you are getting your argan oil for cheap, then it’s most likely not the real deal. It must also be in a dark bottle since light destroys the properties of the oil. Anyway, my hair is rather long. It is down to my waist. It grows relatively quickly, especially with the products I am using. Though I have not measured it so I don’t have precise numbers. I’ve been growing it since around mid or early 2011. I do get some split ends from time to time, which I trim whenever I see one. They primarily come from small tangles I get near the ends of my hair. It’s not too often though. I do not style my hair at all. This is naturally how straight it is and I like it straight. All I do is brush it and I’m all good. The natural color of my hair is a medium or dark brown. Though, I like it dark, preferably black. But, I haven’t dyed it in such a long time. I even did purple once which was awesome, but made an absolute mess of not only the bathtub, but also me. I turned purple for days after dying it. And each time I would wash it again, I would re-turn purple. I have to say though, when I’ve dyed it black, it was harsh on my hair, ammonia, hydrogen peroxide, and the dye claimed to be permanent. But, it would be gone within a few weeks. However, the purple was a gentler dye without those harsh chemicals, but was only semi-permanent. Well guess what? The purple stayed FOREVER! It was there months later. Even after a year, it was there. Even now, two years after the purple dye, when the light hits it right, the ends have a very faint pink color. Just amazing, I loved my purple hair, but not worth the mess. But, I am interested in more natural hair dyes that are easy to manage and do not stain. As a bit of background before I actually talk about the products individually, I had hair problems for many years, like ever since I was a teenager. 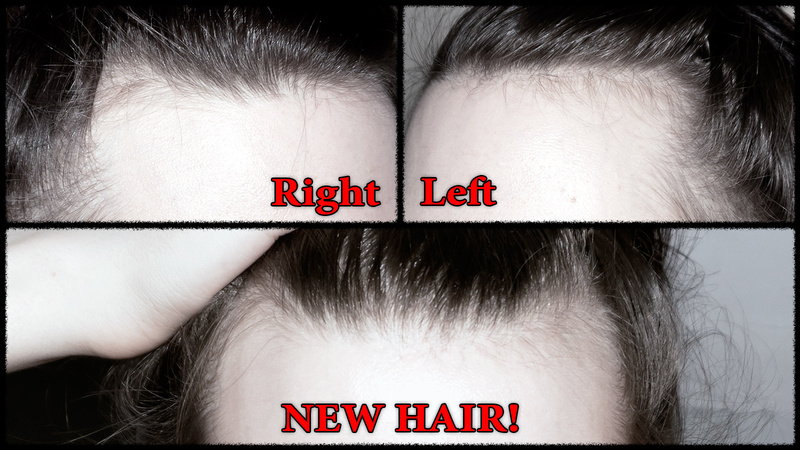 I was losing hair around my temples, but also developed a growing bald spot on the top of my head towards the back. I ended up getting a shot there which helped the hair grow back, but I was still losing hair around the temples at a fast rate. As I got older, in my late teens, the hair around the temples was very thin and blonde. I would run my finger through it and a lot of hair would come out each time. The cause of all this was actually hormonal, specifically dihydrotestosterone (DHT). It was causing me hair loss, acne, and a few other problems. When I got this corrected by taking blockers, my hair significantly improved. It was impressive the amount of hair I was growing. The hair around the temples started to fill in a little bit. At the current moment, it is still a bit further back then I would like as shown in these photos. But also, looking at these photos you can see new hair growing. However, the new hair is even more evident in person. I’m impressed since I was losing all this hair. So, combining blocking and hormone treatments for my hair, along with the shampoo, my hair has improved tremendously since I was a teenager. It continues to improve as well since new hairs are coming up, but will take some time. I use to also wash my hair every day. I used a rather harsh shampoo and my hair and scalp would feel dry. Anything longer than once a day and my hair would feel gross and greasy. But, I decided to go longer than every day. Currently I wash it every four days. The other days I don’t even get it wet. I’ve tried all sorts of things to no shampoo for a while, to various shampoos, and other various things. And as usual, I could not get past that very greasy phase of transitioning to no shampoo, plus it would cause a lot of dandruff. However, while I do use shampoo, I use a product that is not only gentle on hair, but also helps it grown with various natural ingredients. This product is the Pura D’or organic anti-hair loss shampoo. I am using the gold label, but initially I was using the blue label. While I liked the blue one, it did cause some problems. The main issue was that the formula was rather thick and it felt like it was difficult getting it out of my hair. It caused me dandruff either because the product was thick and would stick to my scalp, or it was drying out my scalp. Plus, it seemed to dry my hair a bit. But despite that, I liked it and think it helped with my hair growth. The gold label which I am using now is actually less thick. It does not get stuck to my scalp or cause me dandruff, plus it’s not drying. It feels gentler and better for my hair. It has a very herb-like scent. You can really smell the plants in the formula. The formula for the gold labels has a lot of cleaning agents as the first several ingredients, while the blue one did not. However, as I said, it seems gentler than the blue label. Some of the other ingredients include tea tree oil, argan oil, biotin, saw palmetto, he shou wu, just to name a few. Mostly all things that help reverse hair loss. The shampoo does lather. I’ve used organic shampoos that don’t. But, this one does. The best trick is when it is in your hands, get a little bit of water in it and rub your hands together before applying it to your scalp. It makes it a lot easier to work through your hair. Regarding the conditioner, this isn’t the best conditioner I’ve used. It’s nice, but nothing spectacular. It has some plant proteins and argan oil. It may build up on my hair a little bit, so I have to make sure I rinse it well. It’s not too thick or greasy. But, I’m not sure if I really need it so when I’m done with it I’ll just see how my hair is without it and make that decision. So, every four days I wash my hair using these products. Since I don’t wash it often, they last a very long time. The first bottle lasted me over a year. Anyway, I use about a pump and a half of the shampoo. I make sure my hair is wet. I rub the shampoo between my hands with a little bit of water, which helps it lather and easier to apply. I focus on my roots. Rubbing and massaging it into my scalp for a minute or so, and then rinsing. I then apply the conditioner. I use two pumps and apply it to my ends and gradually work up to about ear level. I keep it on for a minute or two then rinse. I generally wash my hair in cool or warm water, depending on the season. After I get out of the shower I use this detangler brush and brush my hair all out when my head is upside down. My hair is rather thin and I do get knots, or rather tangles since I may have one knot after washing, sometimes not. Mostly tangled up hair though, primarily at the ends. But, this thing works wonderfully. I could not get the knots and tangles out if it wasn’t for this. After I get it all straight, I use argan oil by the same company. It’s 100% pure argan oil, no other ingredients. It comes in this nice pouch and in a dark, glass bottle. This is what things that have argan oil are supposed to come in because light will destroy the properties of the oil. I use the oil on other places as well like my face and my feet and I’ve seen the most improvement on my feet. They are a lot less dry. This stuff is very greasy, so when I use it on my hair, I use just one squirt, rub it between my hands, and mainly use just for the ends. This helps with any kind of dryness, which my hair does get a little frizzy at times when I brush, not so much anymore though because of the argan oil. You cannot get much of this stuff on your hair because it will grease it up really fast. Use it in moderation. Then I blow dry my hair. I cannot stand wet hair, so I have to dry it up quick. It always looks so nice afterwards. Past that, I try to brush my hair often, which doesn’t always happen. I’ve gone several days without brushing and it does get a bit greasy by the fourth day when I would wash again, primarily if I do not brush it. My hair doesn’t get frizzy, even in hot weather. It only did when it would get dry, but the argan oil prevents most of this. Also, due to how thin my hair is, and the missing patches of hair I still have, it can separate in the front a bit, especially the greasier it is. But, as the new hairs continue to grow, I will have more hair to work with. Plus, my hair is not falling out anymore. So, that is my hair and the products I use on it. I like the Pura D’or anti-hair loss shampoo, specifically the gold label, their conditioner is good but nothing spectacular, and I love the argan oil which not only helps my hair, but also any spots I use it on my body. I hope this video was informative. Thanks for watching! My hair is super long, about down to my waist, and I use these organic products on them. At least at the moment of writing this since it’s always possible that I may change it. Regardless, I wash it every four days and it tends to look the best the following day after washing.